Like me, that was probably your initial reaction to the announcement last year that Tom Hardy would be playing Bane in THE DARK KNIGHT RISES. The announcement caught us all off guard, since many of us believed the rumors that Hardy’s character would actually be Dr. Hugo Strange. It was a tough pill to swallow when we heard who he’d really be playing. It conjured up bad memories of Joel Schumacher’s interpretation of the character in BATMAN & ROBIN (R.I.P. Robert “Jeep” Swenson). The vile taste from Schumacher’s Bane is still with us some 15 years later, which is why we were quick to dismiss Nolan’s Bane before we knew anything about him. So the question I have, as I’m sure you do, is how exactly does his mask work? We know Nolan likes to keep his Batman films grounded in reality, basing a lot of the technology in the films on current or past prototypes. Knowing this, I wanted to know how he might explain Bane’s mask. Would the villain use a special painkilling gas, or how about a nice home remedy, like the one’s my wife writes about. To help me figure this out, I consulted with Dr. Michael Leong, Clinic Chief at the Stanford Pain Medicine Center, and his team of experts to try and find out how Nolan will go about MASKING THE BANE. Below are some questions and answers regarding Bane and his mask followed by some great, in-depth analysis by Dr. Leong and his team. 1.) WHAT TYPE OF INJURY (OR SURGERY) MIGHT LEAVE THIS KIND OF SCAR? ML: This scar looks like the types of surgical closures that we see after a cervical laminectomy or extensive cervical fusion. Hence, it looks like Bane has had significant trauma to his cervical spine and corrective surgery to stabilize the area, perhaps causing residual chronic pain. 2.) LOOKING AT HIS VEST, IS THERE A WAY IT COULD ACT IN UNISON WITH HIS MASK? ML: The vest does have regions that look like pockets or bag-like regions that might have some sort of concentrated gas or other compound. Nevertheless, it could be merely armour such as what Batman wears already. 3.) 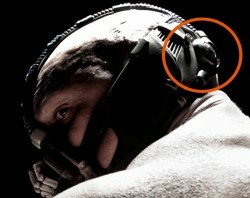 LOOKING AT BANE’S MASK FROM TWO DIFFERENT ANGLES, CAN YOU SPECULATE ON HOW IT MIGHT WORK? ML: Bane’s mask looks like it funnels whatever the compound from the rear of the headpiece; from the central supply at the back of the skull to conduits that rise over the top of his head and feed the intakes over the nose and mouth. The rear portion does look circular and may provide a “dial up” switch so that he can dial up the amount of gas that he needs to inhale during the duration of battle. 4.) COULD THE WIRE, CIRCLED BELOW, ACT AS THE CONNECTOR BETWEEN THE VEST AND MASK? ML: This “wire” or tube could be connected to the mask but also looks similar to intrathecal or intraspinal catheters that anesthesiologists and pain medicine specialists use to inject pain alleviating medicines that circulate in the cerebrospinal fluid that surrounds the spinal cord and brain. But Dr. Leong and his team went beyond these questions and speculated further on how Bane’s mask could be tied to practices in today’s medical field. They believe the mask may have two components to it. 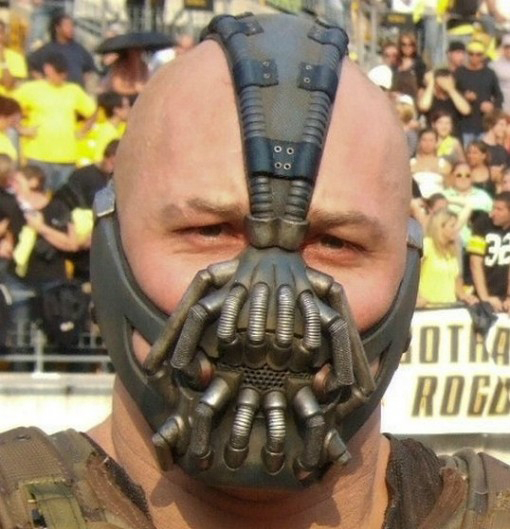 The team also had an interesting theory about the tube on the back of Bane’s neck. 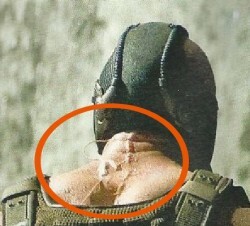 They said that looking at the tube in relation to Bane’s surgical scars, the tube could have a chemical Venom “infused in the intraspinal fluid which would account for his extreme tolerance of pain and possibly increased neurological function with the side-effects of behavioral changes – extreme aggression, maybe even delusions and paranoia.” Remember Bane in the prologue and trailer? He seems to be a tad aggressive, no? This type of scenario would also allow Nolan to implement the Venom aspect from the comic books into his film. It’s safe to say that Nolan’s interpretation of Bane will be a drastic divergence from previous incarnations where the mask was used to deliver Venom into his body and give him super-strength. 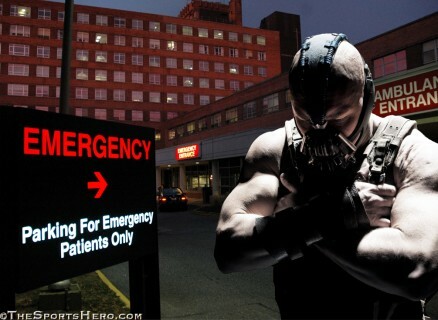 Instead, Nolan has given us a Bane who needs the mask in order to suppress chronic pain from a past injury. If Nolan is going to ground his character in reality, which we’re almost certain he will, then the explanation provided by Dr. Leong and his team could be exactly how he does it. Special thanks again to Dr. Michael Leong and all the faculty involved in helping create this article, Stephen Coleman, Sam Lahidji, Matthew Chen. Will Bane’s mask be his ultimate downfall in TDKR? When Bane said"it would be extremely painful he was'nt referring to himself,he was basically threatening the CIA officer. 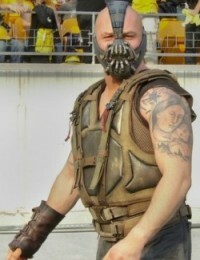 You're absoultely right, though I think to the fans watching we know for a fact it would be painful for Bane as well.